Ten years in the writing, this fearless novel—so powerful it’s banned in Iran—tells the stirring story of a tortured people forced to live under successive oppressive regimes. It begins on a pitch black, rainy night, when there’s a knock on the Colonel’s door. Two policemen have come to summon him to collect the tortured body of his youngest daughter. The Islamic Revolution is devouring its own children. Set over the course of a single night, the novel follows the Colonel as he pays a bribe to recover his daughter’s body and then races to bury her before sunrise. As we watch him struggle with the death of his innocent child, we find him wracked with guilt and anger over the condition of his country, particularly as represented by his own children: a son who fell during the 1979 revolution; another driven to madness after being tortured during the Shah’s regime; a third who went off to martyr himself fighting for the ayatollahs in their war against Iraq; one murdered daughter, and another who survives by being married to a cruel opportunist. An incredibly powerful novel about nation, history and family, The Colonel leaves no taboo unbroken. 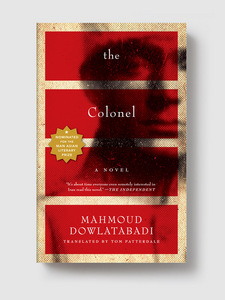 MAHMOUD DOWLATABADI is one of the Middle East’s most important writers of the last century. The author of numerous novels, plays and screenplays, he is a leading proponent of social and artistic freedom in contemporary Iran. Dowlatabadi pioneered the use of the everyday language of the Iranian people as suitable for high literary art, and often examines the lives of the marginal and oppressed in his work, such as in his previous Melville House title, Missing Soluch, his first work translated into English.